Dianne has dedicated her career to working for First Nations with vast experience working in Aboriginal law, specializing in Treaty and Aboriginal rights for First Nations. She is a sought-after speaker on a wide range of Indigenous issues and is a recognized mentor for young Indigenous lawyers and a champion for access to justice. She is Anishinabe from M’Chigeeng First Nation and she and her husband Greg have two children. In her spare time, she enjoys playing tennis and skiing with her family. Born and raised on Manitoulin Island. Currently living in in Minesing, Ontario with her husband and two children. Aboriginal law, with a concentration on Aboriginal and Treaty rights for First Nations. Dianne represents First Nations in Ontario, Québec and Alberta. Dianne was called to the Bar of Ontario in 1998. President and Board Member of the Indigenous Bar Association (2000-2005). Frequent lecturer, author and contributor on issues involving Indigenous law and Indigenous Peoples. Canada’s Top 25 Most Influential Lawyers, Changemaker Category (Canadian Lawyer Magazine, August 2012). I am running for re-election as Bencher for the Central East Region in order to help sustain the momentum of recent advancements at the Law Society, including important developments on issues related to equity, diversity and inclusion within the profession, and Access to Justice. As a bencher and through my past experiences, I have assisted Indigenous communities, women, and diverse ethno-racial, faith-based and LGBTQ communities in Ontario and across the country in promoting Access to Justice and equity and diversity in the legal system. I have also worked towards combating racism and discrimination across Canada. I am proud to have been able to continue this important work in my capacity as Bencher from 2015-2019. The Strategic Planning Steering Group. As a Bencher, I was a strong proponent for the adoption of both the Statement of Principles and the new CPD requirement focused on Equality, Diversity and Inclusion. If re-elected, I will continue to advocate for greater equity, diversity and inclusion in the legal profession, as well as enhanced Access to Justice for all Ontarians. As Managing Partner of a small law firm, I also understand and appreciate the challenges faced by sole and small firm practitioners in Ontario. While local bar associations do their best to provide members with resources, I believe the Law Society can do more to improve the services and supports offered to practitioners in Ontario. Finally, I am committed to further strengthening the programs and resources available to both licensing candidates and lawyers. This includes, but is not limited to, greater access to quality, affordable CPD programs as well as improved mentorship opportunities for licensing candidates and new lawyers. Let’s continue striving to achieve what is expressed in the Law Society’s motto and “Let Right Prevail.” Let’s re-elect Dianne Corbiere as a Bencher. From an early stage in her career, Dianne has impressed me as a very capable, compassionate and caring lawyer. Along the way, Dianne has been recognized as IPC by the Indigenous Bar Association and as one of Canada’s most influential lawyers. Let’s ensure that Dianne’s determined and persuasive voice continues to be heard at Convocation. We need Dianne to be part of our profession’s governing body. Please join me in ensuring that Dianne is re-elected. I am pleased to endorse Dianne Corbiere for Bencher. Dianne has represented the profession with excellence as a lawyer and as a Bencher. Dianne has worked with dignity and perseverance in the Law Society’s Working Together for Change: Strategies to Address Issues of Systemic Racism in the Legal Professions report with respect to the promotion of equality, diversity and inclusion generally. Dianne was one of the leaders and was appointed Chair of the Indigenous Bar Association’s (IBA) National Secretariat Against Hate & Racism in Canada, a national initiative of the IBA and diverse ethno-racial and faith-based community organizations to combat racism, which commissioned papers and held a symposium in October 2005 on Hate Crimes, the Criminal Code and the Charter of Rights and Freedoms at Rama Mnjikaning First Nation, Ontario. Her experience assists our Law Society in its goals to maintain and advance the cause of justice and the rule of law within the context of reconciliation as advanced by the Truth and Reconciliation Commission of Canada in committing groups and institutions such as our Law Society to a renewed nation-to-nation relationship with Indigenous peoples based on recognition of rights, respect, co-operation and partnership. I am delighted to endorse the nomination of Dianne Corbiere for re-election as Bencher of the Law Society of Ontario. Dianne has been instrumental in spearheading much needed systemic change in the legal system to ensure equitable access to justice. She has lent her multiple talents to advance vital training and understanding within the profession on the rights and needs of Indigenous peoples. Much more remains to be done; Dianne’s commitment, insight and boundless energy is vital to our success as a profession seeking to serve the diverse public in Ontario. I have known Dianne for over 20 years. She is trustworthy, experienced, hard-working and has sound judgment. She is making a profoundly positive difference as a LSO bencher. I have known and, on occasion, worked alongside, Dianne Corbiere, candidate for Bencher of the Law Society of Ontario. Dianne is well regarded as a practitioner among members of the Indigenous Bar, and has been a mentor to many. I admire her for her resoluteness and lack of fear in speaking truth to power, as well as for her dedication to advancing Indigenous law students in the profession, as well as for advancing greater understanding of Indigenous law and legal systems law throughout Canada. The profession needs more people of her ability and dedication as well as her leadership. I support her candidacy wholeheartedly. Dianne’s re-election as a Bencher is so important – not just because of her unique perspective on Indigenous issues and diversity and inclusion, but because Dianne is a strong and critical leader with a deep commitment to improving the profession, and society. The Indigenous Bar Association (IBA) is proud to endorse its member and former President, Dianne Corbiere for Bencher in the Central East/Outside Toronto. 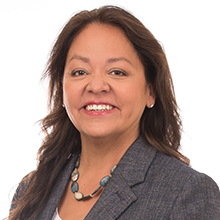 Dianne is the past president of the IBA, an organization which represents Indigenous lawyers, paralegal, judges and academics from across Canada. In 2013, Dianne received the Indigenous People’s Counsel (IPC) a special designation from the IBA which recognizes individuals for their outstanding legal contributions to Indigenous peoples. The Indigenous Advisory Group strongly supports Indigenous representation amongst the Benchers at the Law Society of Ontario and there are several good candidates. We strongly support the continued efforts of ensuring the Truth and Reconciliation Calls to Action are achieved. It is vitally important that the work developed under the Indigenous Framework carry on and we are confident that with strong leadership at the Law Society of Ontario, inclusive of Indigenous Benchers, we will strengthen access to justice for the Indigenous community in Ontario. I had the privilege of working with and getting to know Dianne through our work on the LSO’s Equity and Indigenous Affairs Committee, which she co-chaired. Her thoughtfulness, empathy, diligence, and commitment to the public interest were always on display, and undoubtedly contributed to her effectiveness as a bencher and earned her the respect of colleagues in Convocation and LSO staff. She is a passionate champion for access to justice, addressing challenges faced by licensees from equity-seeking communities, and meaningfully advancing the LSO’s journey towards reconciliation with Indigenous peoples. I’m honoured to support her re-election campaign and I know that her contributions to the work of Convocation will continue to improve the LSO and the profession. Dianne is a changemaker. She has been her entire career. She inspires vision and a sense of potential in those she works with. In her term as a bencher she showed time and again that she will engage and do that hard work in the public interest. An Indigenous leader and champion, Dianne brings her informed and intelligent perspective to all her mandates which extend far beyond those related to equality, diversity and inclusion. When I think about the work that needs to get done at the LSO and the discipline, competency and effort it will take, I think of Dianne. I have had the privilege of working with Dianne during my tenure as bencher, I can say without a doubt she is an asset to convocation. Her leadership during the Indigenous review panel and EIAC convinced me that the profession, the public and the Indigenous community are better served by her presence. I strongly endorse Dianne Corbiere as bencher. We are pleased to endorse Dianne Corbiere for the 2019 LSO Bencher Elections. Dianne has been instrumental during her first term as a Bencher in initiating positive change within the Law Society in both representing and acknowledging Indigenous perspectives. Dianne has approached the issues of access to justice, law society governance and implementation of the TRC Calls to Action in a respectful and constructive manner.